Easy tips for canning tomato juice at home. Also, learn how to turn extra tomatoes from your vegetable garden into fresh delicious tomato juice. Includes recipes for Tomato Juice, canning Tomato Cocktail Juice, and Tomato Juice Garden Blend. 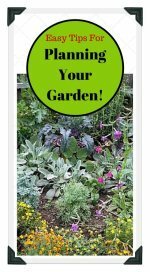 Plump, juicy, ripe tomatoes, brimming with flavor are the most highly prized vegetable grown in backyard gardens. 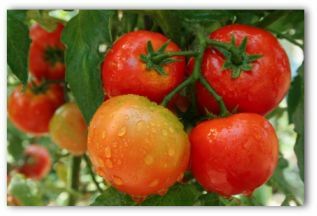 Before the early 1500s, no one in Europe, Asia, or Africa had ever heard of or seen tomatoes. In more modern times, the tomato is found everywhere. In the fresh produce isle and stocked on supermarket shelves available in cans of whole and stewed tomatoes, tomato juice, paste, puree, and sauce. 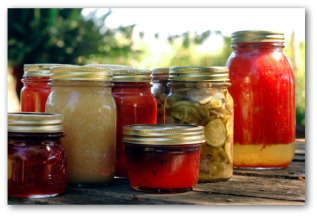 Canning tomatoes at home is an excellent way to preserve extra tomatoes produced in your vegetable garden. It makes a great base for homemade soups and stews, as well as a delicious and healthy beverage. Remove core, blossom ends, and cut into quarters. Simmer until soft, stirring frequently to prevent sticking. Juice tomatoes in a food processor. Strain juice to remove seeds and peels. Heat tomato juice 5 minutes at 190 degrees. Add 1 tablespoon bottled lemon juice to each pint jar. 2 tablespoons of bottled lemon juice to each quart. Ladle hot juice into hot canning jars. Allow ¼ inch room at the top of the jars. Cap the jars, sealing the lids. In a boiling water canner, process pints 35 minutes. Quarts should be processed 40 minutes. The following is a variation for the recipe given above. Add two sprigs of fresh herbs such as basil, dill, or parsley during the last 5 minutes of cooking to make herb tomato juice. Remove herbs before canning tomato juice. 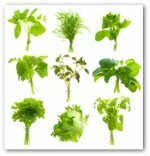 Fresh herbs may be canned with the tomato juice. However, the flavoring will become stronger during storage. Season tomato juice to personal taste with spices, sugar, salt, and hot pepper sauce. 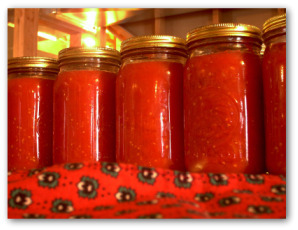 The following recipe for canning tomato juice yields about 7 quarts or 14 pints. Wash tomatoes, drain. Remove blossom ends, core, and slice into quarters. Mix together all the vegetables into a large sized pot. Allow mixture to simmer for 20 minutes. Stir often to prevent juice from sticking to the pot. Use a food mill or processor to juice tomatoes. Strain juice to remove tomato peels and seeds. If desired, stir in salt. Heat juice for 5 minutes at 190 degrees. 2 tablespoons of bottled lemon juice to each quart. Spoon hot tomato juice into hot canning jars. Allow ¼ inch headroom. Adjust lids onto jars. Complete the process of canning tomato juice by process pints 35 minutes and quarts 40 minutes, in a boiling water bath canner. This delicious cocktail can be served chilled with a splash of lemon in each glassful or as a base for Bloody Marys. Place all ingredients into a large preserving kettle and bring to a boil. Lower heat and simmer, stirring occasionally. Continue simmering until mixture is very soft. Then press through a fine meshed sieve. Return tomato juice to kettle.
. Bring juice to the boiling point. Pour at once into hot, clean canning jars. Fill the jars to within ¼ inch of the top. 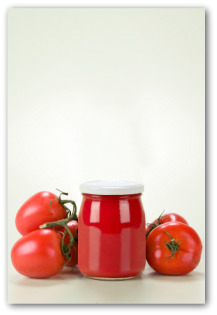 To complete canning tomato juice, process the jars in a boiling water bath for 10 minutes.